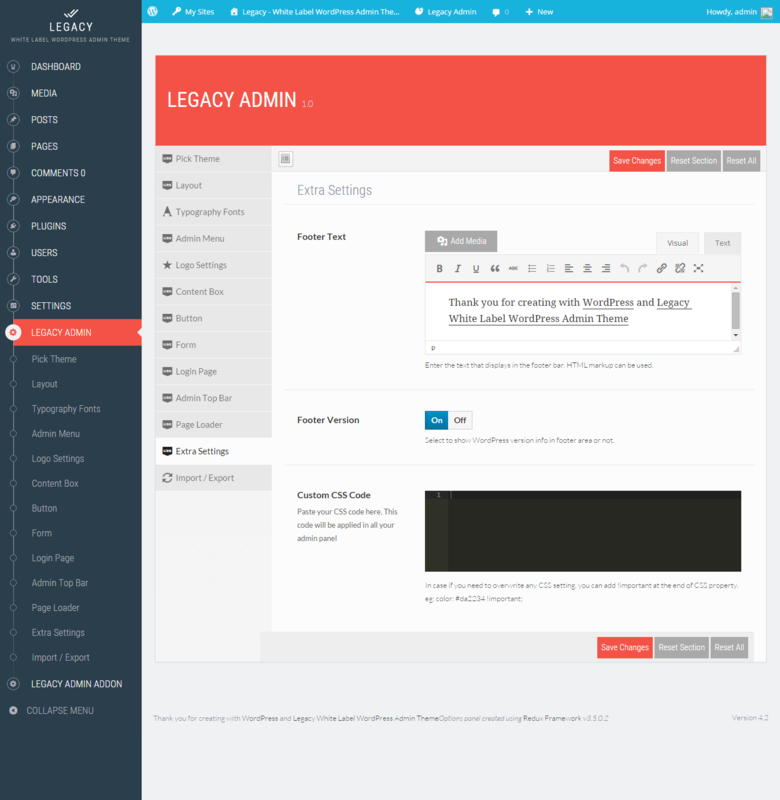 Legacy Admin is most advanced and elegant White Label WordPress Admin Theme in marketplace. 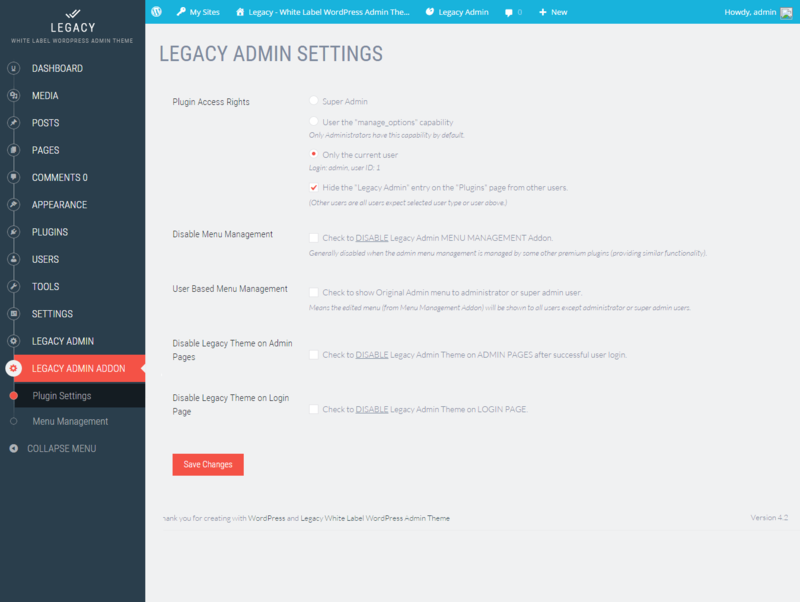 Legacy Admin is compatible with both LTR and RTL modes so can be used for any language. 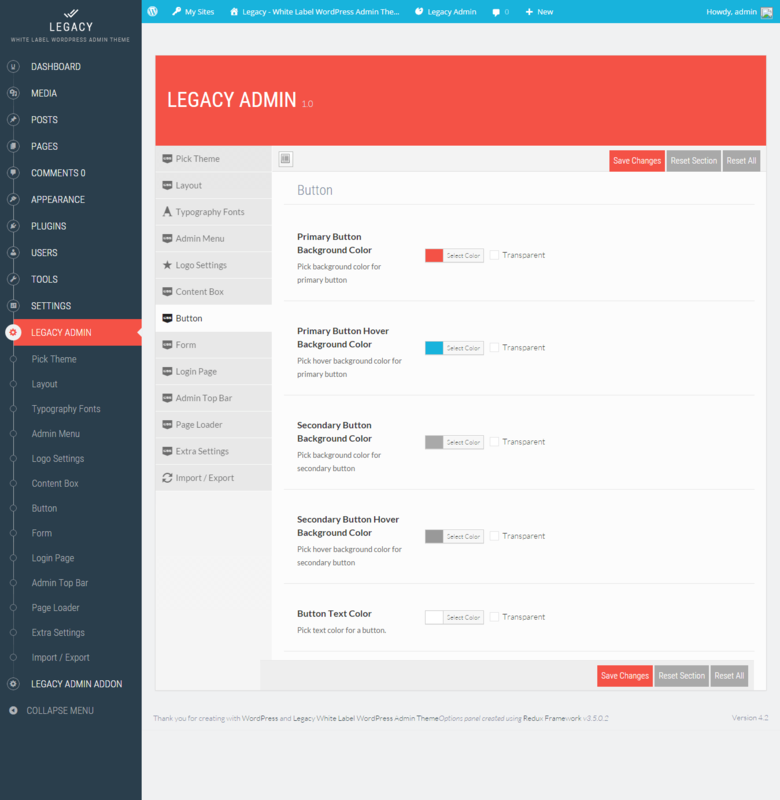 Legacy admin is also Multisite compatible. 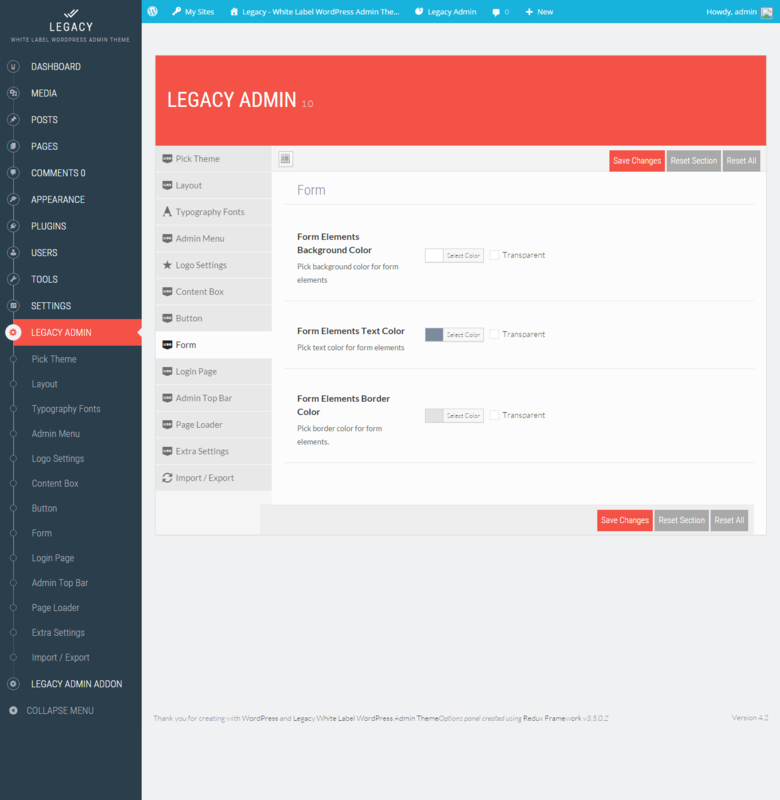 Admin Menu Management Addon is again outstanding feature to use. You can easily Rename,Rearrange menu and submenu items, Change menu icons, Enable/Disable Menu and submenu items. 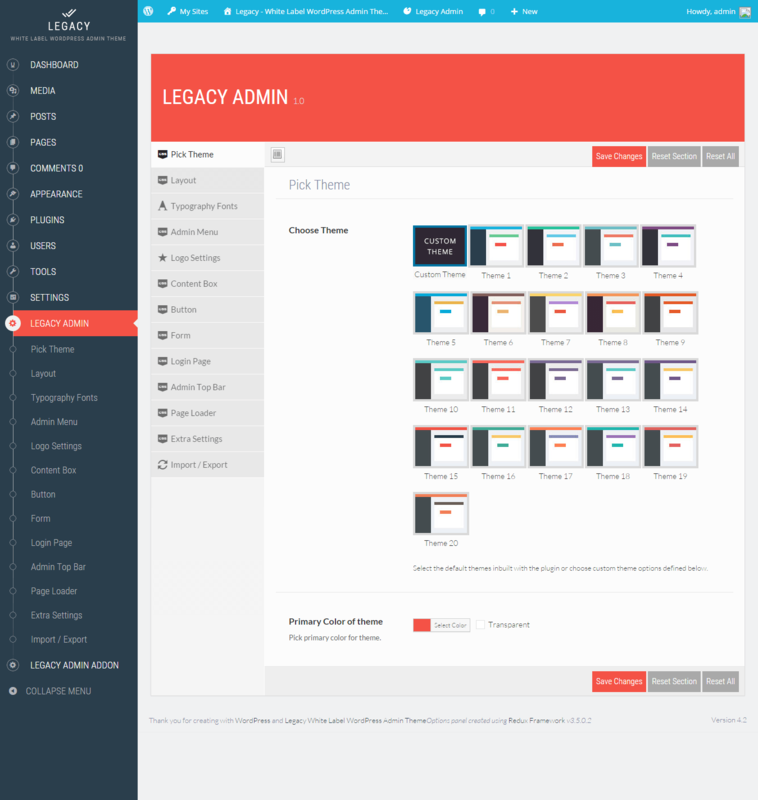 Legacy admin comes with Fully customizable Beautiful Login Screen theme. 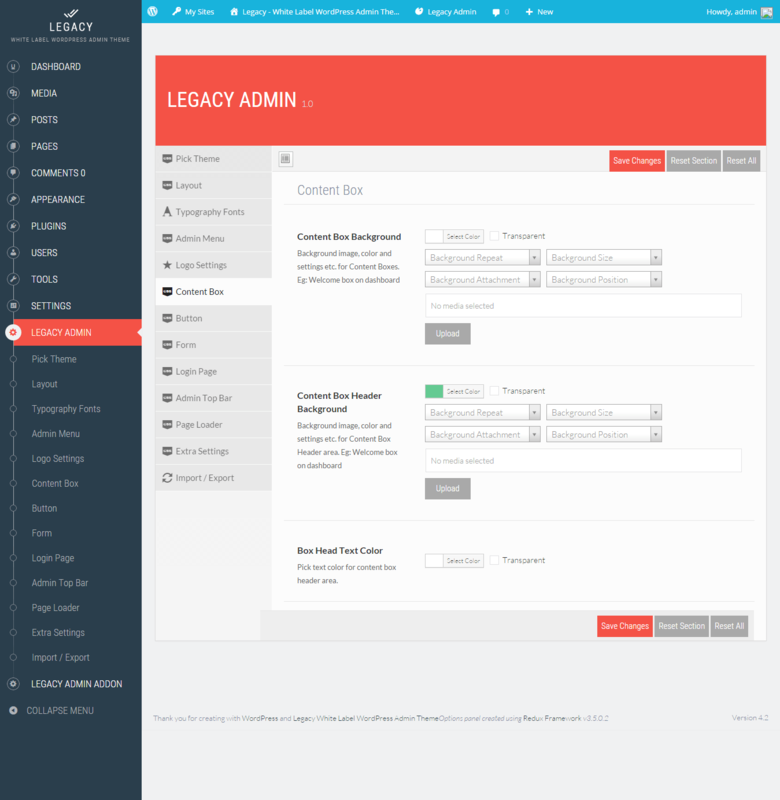 Also Control Top bar links, Customize Footer, Plugin access permissions, Login page customizing options etc. features help you to design web project (in WordPress) for your clients with your own company branding. Customize Login Section completly. Inbuilt theme, also create your own. Customize Look and Feel to your Branding needs. Custom Logo and Favicon for your Own Branding in Admin Panel. Rename Menu and Sub Menu items. Ready to use on a multisite network. Easily install on the multisite network. Customize for Network Activate mode or Individual Sites on network. 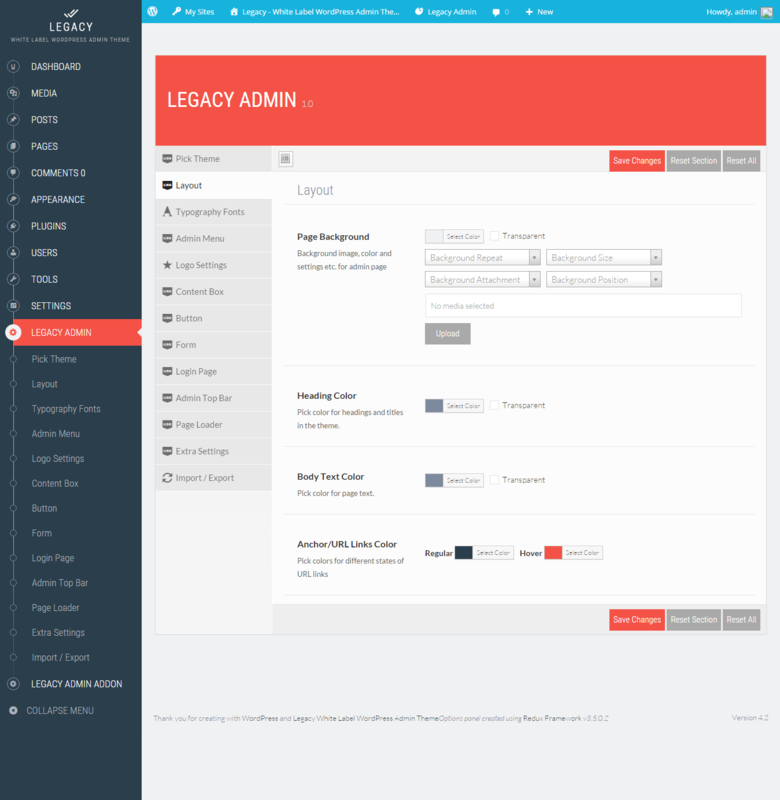 Fully customize look and feel of Admin Panel using vast variety of available options. See Screenshots for all available options. Beautiful Login Screen Theme integrated. Control colors, opacity, background, fonts etc. of any element on login page. Pick a inbuilt theme or create your own. Update images from external URL. To control images on all your client websites from one place only. Control All Admin Top bar links. Customize CSS options as per need. Change User Greeting (Howdy) to desired text. Multi Fonts support. Eg: Different font for heading, menu, body text. Use default computer fonts as back Up fonts for Google Fonts. 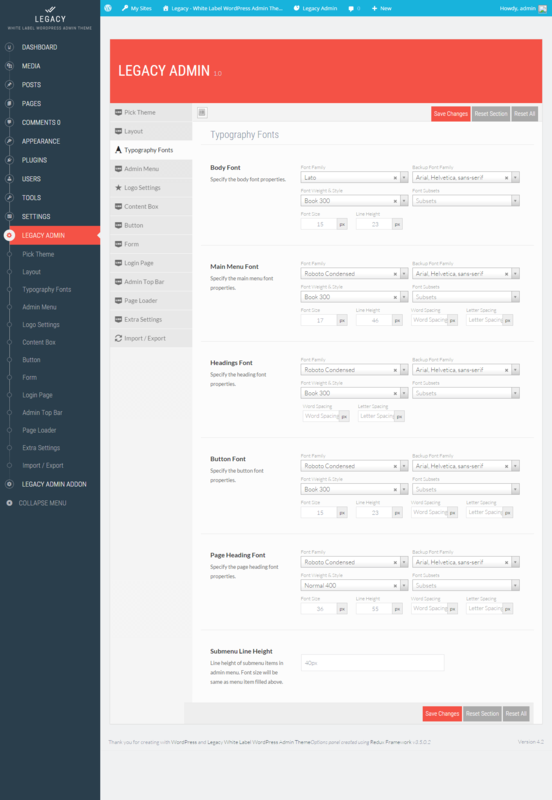 Advanced Typography options to control font-size, line height, font weight, font subset etc. Ability to edit inbuilt themes by importing settings. Admin Menu Editor Pro plugin compatibility added. Compatible with almost all of the wordpress Plugins & Themes. 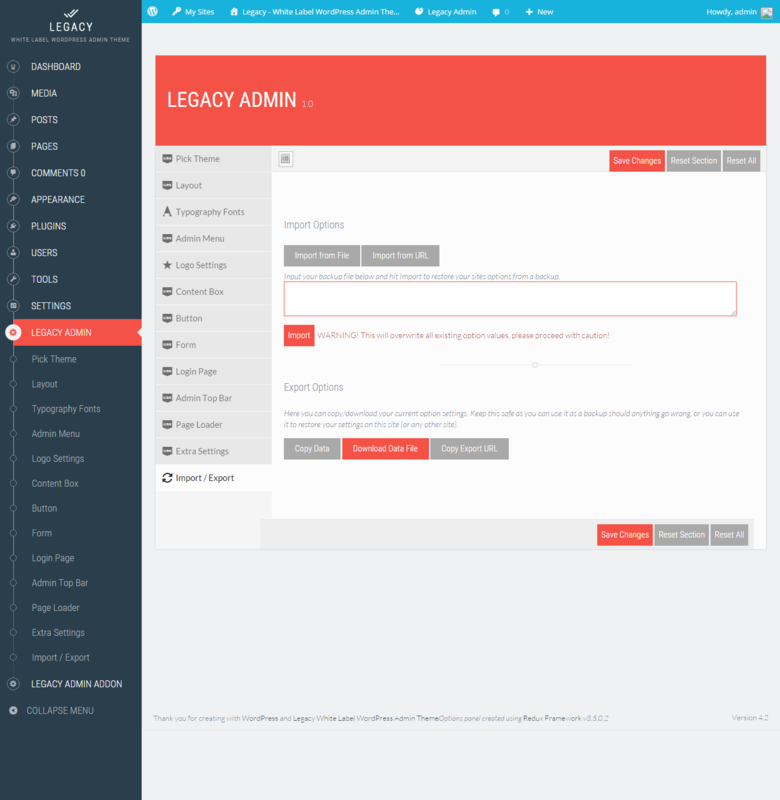 ADDED: Feature to disable admin theme in admin panel and use menu management independently. UPDATE: Removed option to disable login screen styling from options panel. This option is now controlled from plugin permissions page. UPDATE: Wordpress 4.7.4 version compatible. UPDATE: Mod Rewrite / 404 options page issue solved. UPDATE: Improved CSS on plugin upload file page. UPDATE: Added a minified version of CSS for faster page loading. UPDATE: Removed page overlay effect on page loader for faster processing. 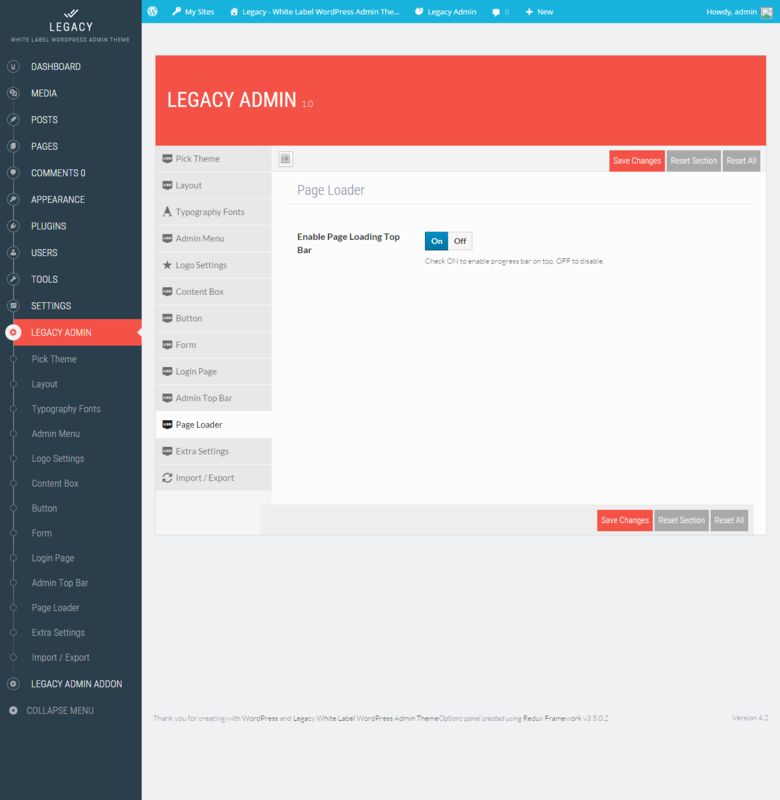 ADDED: Reset menu to original on deactivating and reactivating the plugin. FIXED: Content Box header background color issue with latest WordPress version. UPDATE: Disabled AJAX SAVE in redux framework, to avoid error on few servers “There was problem with your action. Please try again”. UPDATE: Footer version notification for the redux framework disabled. Needed for white label branding feature.